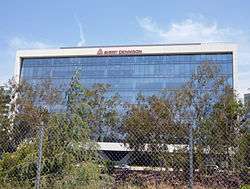 This article is about Avery Dennison Corporation. For the maker of farm equipment, see Avery Company. Avery Dennison logo, designed by Saul Bass in 1975. The Avery logo designed by Saul Bass in 1975 is used exclusively on office products by CCL Industries, which acquired the logo when it purchased Avery Dennison's office products business in July 2013. Avery Dennison Corporation is a global manufacturer and distributor of pressure-sensitive adhesive materials (such as self-adhesive labels), apparel branding labels and tags, RFID inlays, and specialty medical products. The company is a member of the Fortune_500 and is headquartered in Glendale, California. 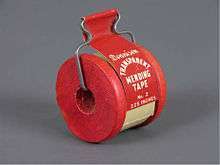 Dennison Mending Tape from the second half of the 20th century. Avery Dennison created a separate division for office products such as binders, file labels and name badges in 1982. The division and its products, sold under the Avery brand and logo, contrasted with the company’s larger materials division in that its products were finished (“converted”) materials, and they were aimed at consumers as well as businesses. Over the next 30 years, the division grew, as personal computing created a market for printable media both at home and at work. However, with the rise of email and the decline in conventional mail, the office products market as a whole began to decline. On July 1, 2013, Avery Dennison completed the sale of Office and Consumer Products and a second business, Designed and Engineered Solutions, to CCL Industries. CCL purchased the Avery office products brand along with the business. Avery Dennison retains its full name, history, brand and logo. The company is headquartered in Glendale, California. It ranked number 435 on the 2015 Fortune 500 list with total sales of $6.0 billion. Its main lines of business are pressure-sensitive materials (contributing 73% of 2015 revenues) and retail branding and informations solutions (contributing 26% of 2015 revenues). The company operates in more than 50 countries and employs 25,000 people worldwide. Its first overseas subsidiary was established in the Netherlands in 1955. The Pressure-Sensitive Materials segment manufactures and sells pressure-sensitive roll-label materials, films for graphic applications, reflective highway-safety products, a variety of specialized tapes, performance polymers, and extruded films. The Retail Branding and Information Solutions segment designs, manufactures, and sells various branding and information management products and solutions for apparel and general retail, including tickets, graphic, barcode and radio-frequency identification (RFID) tags, labels and inserts, woven and printed labels, external embellishments, price management systems, a variety of fasteners, and related supplies and equipment. The information management products that the business provides, including its RFID-based systems, help apparel and other retailers to manage inventory both within stores and across supply chains that today extend for thousands of miles. The ability to accurately identify inventory and replenish it can help improve the shopping experience, as goods are less likely to be out of stock. The company also operates Vancive Medical Technologies, which provides products such as wearable sensors, barrier films, wound dressings and a variety of tapes and securement products for the healthcare industry. Results for Vancive Medical Technologies are reported in Other specialty converting businesses. Vancive Medical Technologies products are sold to medical products and device manufacturers. In 2012, Avery Dennison and 3M Company agreed to settle patent and antitrust litigation between the parties. The litigation began when 3M alleged that Avery Dennison infringed 3M's patents related to retroreflective sheeting used for road signs and other highway and transportation products and requested an injunction to prevent Avery Dennison from selling its OmniCube retroreflective product. The court denied 3M's request, and after Avery Dennison brought claims of its own against 3M for patent infringement and antitrust violations, the parties agreed to dismiss three pending cases. 1 2 3 4 5 "AVY Financial Statements, Google Finance". Retrieved October 26, 2016. 1 2 "Investor FAQs". Retrieved October 26, 2016. ↑ Avery Products Corporation. 1964 Annual Report, p. 17. ↑ "Strategic Report" (PDF). Avery Dennison, PAC Consulting. PAC Consulting. 19 Apr 2004. p. 3. Retrieved 28 May 2012. ↑ "Fortune 500 list". Fortune Magazine. ↑ "Business Summary". Avery Dennison, Business Summary. Avery Dennison. Retrieved 28 March 2013. Wikimedia Commons has media related to Avery Dennison.